Over the past year of co-organizing ADAPTOGEN I have had the privilege of working with many dynamic community members of the Mission district, the greater bay area and visitors passing through from distant locations of the planet. 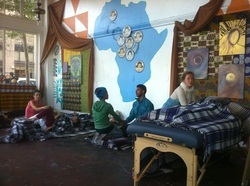 The collective resonance of openness and dedication to the healing arts movement is inspiring. I am grateful to be a live participant at this time in history. I entered into the journey of founding ADAPTOGEN with Leslie and David with the belief that by deepening knowledge and practice of complimentary healing arts, individuals can build stronger, collectively autonomous communities. The accompanying aim was to help establish a regular place within the neighborhood where practitioners and people dedicated to supporting the emergence of complementary healing arts modalities can unite our strengths for the good of the whole. Happily, over a year later this belief has been vindicated and this goal has been reached. From east to west bay and north to south, ADAPTOGEN is a commonly known and eagerly anticipated monthly occurrence in the Mission district. Many a participant, either as volunteer or guest, has engaged the magic that is sparked by the convergence of humans with the shared intention of healing. Not only have individuals come together to share the healing arts, but the salon has proven to be a valuable opportunity for local, independent businesses to unite strengths and support each other in our endeavors to serve the community. Om Shan Tea, Homemade Hustle and other local independent caterers have all contributed to the vortex of vital human resources and soul sustenance that is the monthly salon—a medicinal adaptogen in the form of an event with qualities which increase resistance and resilience to stress, enabling the collective body to adapt around any problems and return to homeostasis. Of course, ADAPTOGEN still has much development to undergo. For its first year, we ran it on a shoe string as a donation based, volunteer run event, working out the structure and roles as we went; to paraphrase the title of one of my favorite community education books: We Made the Road By Walking—all the while pursuing values in line with the ICA statement on the Cooperative Identity: self-help, self-responsibility, democracy, equality, equity and solidarity, and ethical values of honesty, openness, social responsibility and caring for others. Although ADAPTOGEN is now in the crucial stage of making it through this second year of establishment and settling its more long term structure as an entity, the natural course of my own personal path is diverging from its previous role as an intimate organizer, coordinator and cultivator of the salon’s birthing body. I write this letter as a public reflection on my time co-founding this event and to announce that I am shifting the concentration of my energies and attentions to my private practice as a CranioSacral Certified, Reiki Master Teacher and to expand my exposure to the myriad ways in which different healing arts entities are organizing and integrating themselves into Western culture. As a co-founder of ADAPTOGEN and having dedicated uncountable volunteer hours toward the inception, foundation and cultivation of the Mission District’s first official healing arts salon, this decision has been anything but easy. But after many hours of meditating on what my personal path calls for as we enter this New Year, I know this is the proper course to take. In December I traveled to my homeland of southeast Wisconsin to support my family in seeing my grandparents through this late stage of their lives and to begin a survey of healing arts across the country. Beginning here in the heart land, I have begun what I call my Alexiteric Travels, researching and visiting different types of healing arts centers across the country. The journey will carry me from this northern Midwest region down and across the southwest and back up the pacific coast to the bay where I will settle my private practice and synthesize the findings of my survey. I will keep a log of my experiences, questions and findings in the blog section of my website, alexiteric.net, as well as on facebook and other online accounts. I invite you all to follow my progress over these next few months and to contact me with any feedback or information you might see as relevant to my survey, or just to offer votes of confidence to help me along the way. Thank you to David and Leslie for your efforts in establishing this great event and carrying on its continued development. Thank you to the many volunteers who have played integral parts in establishing and nurturing the event and to the core group of Tatiana, Peter J, Matt, La and Josh for your outstanding contributions to helping this thing along. Thank you to Om Shan Tea and Homemade Hustle and to the other various local caterers who have made their vital contributions to creating the sacred space and providing the healing arts of tea, food and human communion. Thank you to Twinspace for being the home of this special event. Thank you to all the musicians, guest speakers and of course to the practitioners sharing their healing powers and to all of those with the courage and wisdom to come and receive the fruits of this bounty as supporting guests. May ADAPTOGEN continue to evolve in the best way possible for all. We’ll be in touch and see you back in the bay some time this spring. Folks, ADAPTOGEN has teamed up with Om Shan Tea to deliver "an urban tea oasis" after all we both "inspire healing, conscious community and holistic wellness!" 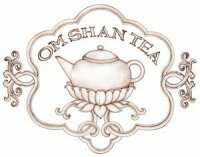 Visit Om Shan Tea at 233 14th Street, San Francisco, CA 94103 OR call 1.888.SIP.TEAS [888.747.8327], they are open noon to midnight everyday of the week. 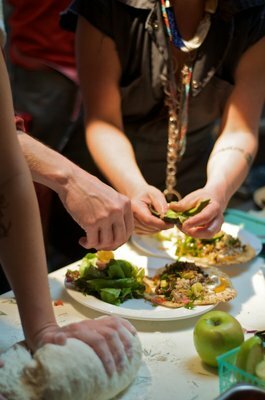 Plus, Homemade Hustle will be ADAPTOGEN's caterer! Featuring "nourishing delicious food" that is "farm-to-fork style of eating!" You may already know Homemade Hustle from their Beats and Brunch at 11am-3pm Saturday and Sunday at Little BaoBob - 3388 19th Street, San Francisco, CA 94110. 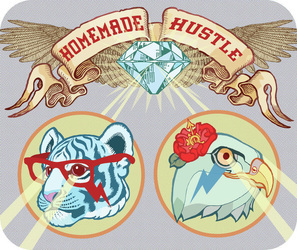 Add Homemade Hustle as your FaceBook friend! We love working with our community! 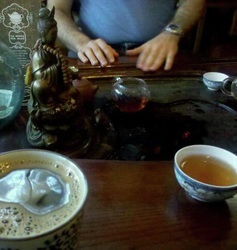 Come and join the ADAPTOGEN Healing Arts Salon Sunday 10.10.10 and enjoy, Om Shan Tea and Homemade Hustle. Healers, readers and holistic practitioners: you are invited to come to this fun exchange to experience the healing practices of your friends and community members and share with them your own. Please bring food to share if you are able and feel free to come for any amount or all of the event. Parking should be easy ...after 6. We are psyched to be using a new to us beautiful space generously donated by an Adaptogen collective member. Guests are welcome to arrive as early as 5 to use full service kitchen to prepare food or to set up.